The development of Nepartak made the second-latest time within a season for the first named storm to develop and ended a 199-day period (from December 17, 2015 – July 3, 2016) during which no named storm was active in the basin. Tropical Storm Mirinae reached peak intensity while making landfall over the Red River Delta, causing very severe damage in Northern Vietnam. By the end of August, three storms had hit the Japanese island of Hokkaidō, the most since 1951. In September, Typhoon Meranti reached peak intensity with a minimum pressure of 890 hPa, becoming one of the most intense tropical cyclones on record. Typhoon Chaba became the strongest typhoon to strike South Korea since 2012. Tropical Storm Aere and a tropical depression brought the worst flooding in Vietnam since 2011. The last storm of the season, Typhoon Nock-ten, became the strongest tropical cyclone ever recorded worldwide on Christmas Day (December 25) since at least 1960, in terms of 1-minute maximum sustained winds. During the year several national meteorological services and scientific agencies forecast how many tropical cyclones, tropical storms, and typhoons will form during a season and/or how many tropical cyclones will affect a particular country. These agencies included the Tropical Storm Risk (TSR) Consortium of University College London, PAGASA and Taiwan's Central Weather Bureau. Some of the forecasts took into consideration what happened in previous seasons and the El Niño conditions that were observed during the previous year. The first forecast of the year was released by PAGASA during January 2016, within its seasonal climate outlook for the period January – June. The outlook noted that one to two tropical cyclones were expected between January and March, while one to three were expected to develop or enter the Philippine Area of Responsibility between April and June. During March the Hong Kong Observatory predicted that the typhoon season in Hong Kong would be near-normal, with four to seven tropical cyclones passing within 500 km (310 mi) of the territory compared to an average of six, which was revised to five to eight tropical cyclones in August. On May 7, Tropical Storm Risk issued its first forecast for the season and predicted that it will be a quiet season, with 22 tropical storms, 13 typhoons, and 6 intense typhoons developing during the year, while an ACE Index of 217 was also forecast. Ahead of the Thailand rainy season starting during May, the Thai Meteorological Department predicted that two tropical cyclones would move near Thailand during 2016. They predicted that there was a high chance that the first tropical cyclone would move past northern and north-eastern Thailand during August or September. The second tropical cyclone was predicted to move past Southern Thailand during October and November. On June 28, Taiwan's Central Weather Bureau predicted that between 19 and 23 tropical storms would develop over the basin, while two — four systems were expected to affect Taiwan itself. On July 6, TSR released their second forecast for the season. They predicted mostly the same numbers as the previous forecast, but raised the number of intense typhoons to 7. PAGASA issued their second and final forecast for the year on July 15, within its seasonal climate outlook for the period July – December. The outlook noted that between five and eleven tropical cyclones were expected between July and September, while four to nine were expected to develop or enter the Philippine Area of Responsibility between October and December. TSR issued their final forecast for the season on August 8, sustaining the tropical cyclone numbers, however its ACE was slightly lowered than the previous forecast. Despite the season's late start, the 2016 season was a normal and active season with a total of 53 tropical depressions, of which 26 became tropical storms. After five months of inactivity, the first tropical depression developed on May 26, making it the fifth-latest season for a system to form. According to existing records only four other seasons started later—the 1973, 1983, 1984, and 1998 seasons. Tropical activity throughout the basin became marginally favorable for development, and two tropical depressions developed during June. On July 3, Nepartak became the first named tropical storm, making it the second-latest first named storm on record. Nepartak's naming ended a 199-day period (from December 17, 2015 to July 2, 2016) during which no named storm was active within the basin; this period tied the 199-day period from December 22, 1997 to July 8, 1998. Nepartak reached Category 5 super typhoon intensity before making landfall in Taiwan and East China, causing a total of US$1.52 billion of damage. In late July, Tropical Storm Mirinae reached its peak intensity while making landfall over Red River Delta in Northern Vietnam. The storm caused a total of US$334 million of damage in Hainan and Vietnam. Later, Nida reached near typhoon strength; it affected the Philippines, South China and Vietnam, but its damage was lower than that of Mirinae. The season became more active in August, with 7 named storms. Except Dianmu, which affected South China, Indochina, all of the tropical cyclones in August affected Japan and the Russian Far East. By the end of August, three storms (Chanthu, Lionrock and Kompasu) had hit the Japanese island of Hokkaidō, the most since 1951. Lionrock was a large, powerful, long-lived and erratic tropical cyclone which caused significant flooding and casualties in North Korea and Japan in late August. In September, Typhoon Meranti became the strongest typhoon in terms of pressure since Typhoon Megi in 2010, as well as the strongest typhoon in terms of sustained winds since Typhoon Haiyan in 2013, and the second-strongest tropical cyclone worldwide in 2016, only behind Cyclone Winston, in terms of pressure. Typhoon Megi reached its peak intensity as a Category 3 typhoon while making landfall over Taiwan. Both Meranti and Megi made landfall in Fujian, China, and they caused a total of US$3.6 billion of damage. Rai became a weak tropical storm before it made landfall in Vietnam, Laos and Thailand in mid-September, causing flooding and moderate damage. Typhoon Malakas impacted Japan with a total of nearly $740 million of damage as a Category 4 typhoon. In late September and early October, Typhoon Chaba reached Category 5 super typhoon intensity and became the strongest tropical cyclone to make landfall in South Korea since Sanba in 2012. Chaba also caused 7 deaths in the country. A tropical depression formed east of the International Dateline on October 3, and entered the basin before developing into Typhoon Songda. Songda struck the Pacific Northwest region of the United States and Canada as a powerful extratropical cyclone. Severe Tropical Storm Aere affected parts of Southeast Asia in mid-October, including the worst flooding in Vietnam since 2010, causing a total of US$112 million of damage. Later, Typhoon Sarika became a powerful typhoon, and affected the Philippines, China and Vietnam, causing severe damage as well as severe flooding in southern China. After Sarika, Typhoon Haima reached Category 5 super typhoon strength before impacting the Philippines and China, causing a total of US$1.93 billion in damages. Haima was the most severe tropical cyclone to affect Hong Kong in October since 1995. In early November, a tropical depression made landfall in Southern Vietnam and caused heavy flooding throughout central and southern Vietnam, causing moderate damage. In late December, Nock-ten became the strongest Christmas tropical cyclone on record anywhere in the world since at least 1960 in terms of 1-minute sustained winds, before impacting the Philippines. During May 25, Tropical Depression 01W developed over the northern South China Sea, about 600 km (375 mi) to the south of Hong Kong, China. The system subsequently moved north-westwards and slightly developed further, before it made landfall near Yangjiang in Guangdong, China during the next day. The system subsequently quickly weakened and degenerated into an area of low pressure during May 27. The system brought squally and heavy rain to the Pearl River Delta, including parts of Hong Kong, Macau and Guangdong province, where a bridge was destroyed by flooding and two people were injured. At the Macau Ferry Terminal, two passengers were injured as a vessel collided with the terminal, while there was no significant damage reported within Hong Kong. Damage in China were at CN¥60 million (US$9.14 million). Early on June 26, the JMA and PAGASA reported that Tropical Depression Ambo had developed over the Philippine Sea, about 555 km (345 mi) to the east of Manila on the island of Luzon in the Philippines. The system was located within an environment that was thought to be favourable for further development, with low vertical wind shear and a fair outflow. However, the depression's broad low level circulation centre was moving north-westwards quickly, which meant that the circulation's southern edge could not close off and was exposed. The system subsequently made landfall on Luzon in Philippines later that day, where according to PAGASA it quickly weakened into a low pressure area. However, the JMA continued to monitor the system as a tropical depression throughout June 27, as it emerged into an unfavourable environment for further development in the South China Sea. The depression subsequently made landfall on China's Guangdong Province, before it was last noted during June 28, as it dissipated over land. Several sea-trips in the Philippine island province of Catanduanes were cancelled with a total of seven passengers, three rolling cargoes and a sea vessel stranded at the port of Virac. On July 2, a tropical depression formed 780 km (485 mi) to the southeast of Yap State. The following day, the depression became a tropical storm, receiving the name Nepartak. By July 4, organization increased and Nepartak intensified into a severe tropical storm. At that time, PAGASA assigned the local name Butchoy as it entered their area of responsibility. Early on July 5, Nepartak started to undergo rapid intensification, reaching typhoon strength. Nepartak soon reached Category 5 super typhoon intensity. During the course of July 6, Nepartak reached its peak intensity with 10-minute sustained winds of 205 km/h (125 mph) and a minimum barometric pressure of 900 mbar. Nepartak started weakening during the next day, before making landfall in Taitung City on July 8. Nepartak weakened to a tropical storm as it made its second landfall in Shishi, Fujian. Nepartak rapidly deteriorated over land and fully dissipated on July 10. Two people drowned on July 7 after being washed out to sea by strong winds in Taiwan. A total of seven major highways were damaged in Taiwan, too. At least 10 people were killed and 11 others were reported missing across Fujian and Jiangxi. At least 3,144 homes were destroyed and 15,800 hectares (39,000 acres) of crops were damaged; total economic losses reached ¥2.2 billion (US$320 million). Overall, Nepartak killed a total of 86 people, mostly from Fujian province, and caused a total of ¥9.99 billion (US$1.49 billion) of damage. During July 14, a tropical disturbance developed about 400 km (250 mi) to the west-northwest of Guam. At this time atmospheric convection surrounding the system was flaring, over the system's weak but developing low level circulation center. However, as a subtropical ridge of high pressure extended a significant amount of dry air over the disturbance, conditions were assessed to be marginally favorable for further development of the system. Over the next couple of days the system gradually developed further as it moved north-westwards and was classified as a tropical depression by the JMA during July 15. After the system had consolidated further, it was classified as Tropical Depression 03W by the JTWC during July 17. However, the system weakened during that day as it moved polewards, along the western edge of the subtropical ridge of high pressure, into an area of increasing vertical wind shear. As a result, the JTWC expected the system to quickly dissipate and issued their final advisory later that day. However, over the next couple of days the system continued to move northwards and impacted the Ryukyu Islands, before it was last noted by the JMA during July 20. During July 21, a subtropical disturbance developed at the tailend of a mid-latitude trough of low pressure, about 775 km (480 mi) to the east of Iwo-To. Over the next day, deep atmospheric convection developed over the system's elongated low level circulation center, before it was classified as a tropical depression by the JMA during July 22. Over the next day, as the storm moved north-northeastwards around a subtropical ridge of high pressure, its structure improved as it developed a warm core and consolidated. The hybrid system was subsequently classified as Tropical Storm 04W by the JTWC during July 23, before the JMA named it Lupit later that day. Over the next day, Lupit peaked with sustained winds of 75 km/h (47 mph), as it went through an extratropical transition and took on frontal characteristics. Lupit subsequently became extratropical during July 24, before it dissipated during July 26, as it moved into the Sea of Okhotsk. Mirinae was first noted as a tropical depression during July 25, as it moved off the west coast of Luzon into the South China Sea, about 300 km (185 mi) to the east of the Paracel Islands. The next day, it was named Mirinae after it became a tropical storm. Mirinae subsequently weakened slightly as it made landfall later that day, near Wanning and crossed Hainan Island. It re-intensified on moving into the Gulf of Tonkin. The system reached its peak intensity as a severe tropical storm on July 27, with 10-minute sustained winds of 95 km/h (59 mph). The system made landfall about 110 km (70 mi) to the south of Hanoi in northern Vietnam later that day. Mirinae subsequently weakened gradually over northern Vietnam, before it dissipated to the north of Hanoi. In Hainan, economic losses caused by the storm reached 300 million yuan (US$45 million). By July 29, the storm had left five people dead and five others missing in Vietnam. Severe damage to infrastructure was reported in Northern Vietnam, with damage to power lines causing blackouts and power cuts in some areas. Mirinae also sank 12 boats, destroyed the roofs of 1,425 houses and uprooted about 5,000 trees. Damages in Vietnam amounted to ₫6.442 trillion ($288.8 million). During July 28, a tropical depression developed about 1,020 km (635 mi) to the east-southeast of Manila in the Philippines. Over the next day as the system moved north-northwestwards under the influence of a subtropical ridge of high pressure, deep convection started wrapping into the system's low level circulation center. During that day PAGASA assigned the local name Carina. On July 31, Nida made landfall over the area between Baggao and Gattaran of the Cagayan province in the Philippines at 13:20 PST (05:20 UTC) as a severe tropical storm. At 03:35 CST on August 2 (19:35 UTC on August 1), Nida made landfall over Dapeng Peninsula of Shenzhen, Guangdong, China as a severe tropical storm. During August 2, the JMA started to monitor a tropical depression that had developed within a favourable environment for further development, about 565 km (350 mi) to the northeast of Hagåtña, Guam. The system had a broad and weak low level circulation centre, which had atmospheric convection flaring around the system's outer edge. Over the next couple of days the system slowly moved north-eastwards, before it was classified as Tropical Storm 07W by the JTWC and named Omais by the JMA during August 4. A high pressure system kept Omais to the east of Japan producing hot and steamy conditions across Japan approximately about 1000 people were taken to hospital due to heat stroke as the heat index climbed well into the 40s. On August 9, Omais transitioned to an extratropical cyclone as it moved over cooler waters of the northwestern Pacific Ocean, Omais fully disapated on August 10. On August 7, the JMA started to monitor a tropical depression that had developed about 390 km (240 mi) to the west of Wake Island. Over the next day the system gradually developed further as it moved south-westwards, before the JTWC classified it as Tropical Depression 08W during August 8. Later that day, the JMA upgraded 08W to a tropical storm, naming it Conson. Despite some moderate wind shear, Conson slowly intensified and later reached severe tropical storm strength on August 10. The JTWC later stated that deep convection was forming near the center of Conson, however shortly thereafter, convection became disorganized. By August 11, convection once re-intensified again, however its LLCC became exposed, causing the JTWC to lower its intensity to lower-end of tropical storm strength. The JMA also downgraded Conson to a tropical storm. During the next day, satellite image showed that the convective structure of Conson was beginning to deteriorate as it started to interact with drier air, suppressing convection. The center of Conson became much broader and exposed early on August 13. While moving northwestward, Conson became better defined than before, however its convection was more shallow as it started to interact will cooler sea-surface temperatures and drier air. By August 14, the JTWC issued their final warning on Conson as it started to undergo its extratropical transition with a result of a strong wind shear and the interaction of the mid-latitude baroclinic zone. The JMA tracked Conson until it fully transitioned into an extratropical cyclone on August 15 and made landfall near Nemuro Peninsula. Its remnants were tracked until midday of August 16. During August 11, the JMA started to track a tropical depression, whereas the JTWC issued a Tropical Cyclone Formation Alert, as it was located about 695 km (432 mi) west-northwest of Guam. After meandering eastwards, the JTWC designated the system as 09W, while the JMA immediately upgraded 09W to a tropical storm and assigned it the name Chanthu on August 13. The JTWC followed suit early on August 14. With an improving LLCC, Chanthu rapidly developed into a severe tropical storm from the JMA, as it was later located over in an area of favorable environments of strengthening. Despite a high chance of strengthening and a well-defined LLCC, Chanthu stopped generating convection as the JMA downgraded it to a tropical storm. Later that day, flaring convection was associated with its LLCC as it was beginning its extratropical transition while interacting with mid-latitude flow. Therefore, early on August 17, Chanthu once again reached severe tropical storm strength as it attained its peak intensity with a minimal pressure of 980 millibars (28.94 inHg), while east of the Japanese archipelago of Honshu. Shortly thereafter, the JTWC issued its final warning on Chanthu. The JMA issued its final warning a few hours later as it made landfall over Cape Erimo of Hokkaido, Japan, at peak intensity. Agricultural damage in Japan were at ¥9.49 billion (US$94.7 million). On August 15, a tropical depression developed about 305 km (190 mi) to the southeast of Hong Kong. During the course of August 17, enhanced satellite imagery showed that Dianmu was rapidly organizing with deep flaring convection surrounding its LLCC. Dianmu made landfall in Haiphong and Thái Bình Province in northern Vietnam. While overland, the system gradually weakened into a tropical depression, before it degenerated into an area of low pressure during August 20 while over Myanmar. In the province of Hainan, China, Dianmu's heavy rains brought the water level at the Longtang Dam on the Nandu River to a ten-year high of 13.35 metres. Hainan's capital, Haikou, experienced flooding in some areas. Over in Quảng Ninh, a total of 11 houses were collapsed and total damages in the city amounted to 3.5 billion VND (US$157,000). A tropical depression formed northwest of Guam on August 17. On August 19, the system became a tropical storm and was named Mindulle early on August 19. However, an upper-level low to the north and the predecessor of Tropical Storm Kompasu to the northeast were stifling the development of poleward outflow. Moving on the eastern edge of a relatively high-latitude monsoon gyre and being steered by the southern extension of the subtropical ridge anchored east of Japan, the intensification of Mindulle was limited on August 20, owing to modest dry air entrainment resulting in flaring convection near and surrounding the LLCC. Although Mindulle became a severe tropical storm when it was approximately 380 km (240 mi) northwest of Chichi-jima at around 15:00 JST (06:00 UTC) on August 21, outflow from Tropical Storm Lionrock to the west was inhibiting further development, as the distance between their centers was only about 600 km (370 mi) at that time. With warm sea surface temperatures of between 30 to 31 °C (86 to 88 °F), good equatorward and poleward outflow channels, as well as low vertical wind shear, Mindulle became a typhoon at around 03:00 JST on August 22 (18:00 UTC on August 21), when the center was located about 40 km (25 mi) east of Hachijō-jima. At around 12:30 JST (03:30 UTC), Mindulle made landfall over the area near Tateyama, Chiba. The system that was to become Typhoon Lionrock was first noted as a hybrid disturbance on August 15, while it was located about 585 km (365 mi) to the west of Wake Island. It developed into a tropical depression about 690 km (430 mi) northwest of Wake Island on August 16. At this time the disturbance had a broad and poorly organized low level circulation centre, which had some shallow bands of atmospheric convection wrapping loosely around it. Over the next day, the system moved northwards, while a TUTT cell created subsidence and high vertical windshear over the system. The JTWC considered the system to be subtropical at this time, as its structure was asymmetric, with deep convection displaced to the north and east of the system's low level circulation centre. From late August 20 to early August 22, the system had at least somewhat an interaction with Mindulle, taking an erratic and slow path for a bit. Restrengthening begun again quickly, with the system already starting to develop an eye in mid-August 23. In the middle of the 24th of August the system reached an initial peak as a Category 3-equivalent storm. Lionrock entered the Philippine Area of Responsibility on August 25, 2016, and PAGASA assigned Dindo  as the local name, while Lionrock had begun an eyewall replacement cycle early that day, weakening to a Category 2-equivalent storm. After two days, early on August 26, it finally completed the eyewall replacement cycle, but slow restrengthening occurred. Another two days passed until it reached its full peak as a Category 4-equivalent storm, which rapid weakening ensued after. On August 29, Lionrock turned towards the northwest due to a high pressure system located east of Japan, putting it on an towards the northeastern region of the country. Lionrock made landfall near Ōfunato, a city in Iwate Prefecture, Japan. This made Lionrock the first tropical cyclone to make landfall over the Pacific coast of the Tōhoku region of Japan since the Japan Meteorological Agency began record-keeping in 1951. On August 18, the JMA started to monitor a tropical depression that had developed, about 1,300 km (810 mi) to the northeast of Guam. The JTWC started issuing advisories by the next day as it was immediately classified as a tropical storm and the identifier of 13W. The JMA followed suit early on August 20, and was named Kompasu. Despite wind shear and an exposed LLCC, tightly curved banding was reported embedded within the northern extent of a very broad "monsoon gyre" circulation. Both agencies reported that Kompasu had reached its peak strength as a minimal tropical storm with a minimum barometric pressure of about 994 mbar. Later that day, deep convection of Kompasu had rapidly decreased as it was located in marginally favorable environments with low wind shear and sea-surface temperatures of about 26 degrees Celsius. On August 21, the JTWC downgraded Kompasu to a tropical depression and issued their final bulletin on the system. The JMA did the same and issued its final advisory on Kompasu as it transitioned into an extratropical system. Floods in Hokkaidō killed one person when a driver was stranded in his flooded car. During August 23, Tropical Depression 14W developed about 75 km (45 mi) to the east of Andersen Air Force Base, Guam. Moving northward on the next day, the LLCC of 14W became exposed with a deteriorating convective signature. Flaring deep convection became disorganized into a weakly-defined center due to strong northerly wind shear; the JTWC assessed 14W's winds only at 25 knots. Due to a rapidly decaying LLCC with minor bursts of convection, both the JMA and the JTWC issued its final warning on 14W later that same day. A low-pressure area developed into a tropical depression southeast of Taiwan early on August 31. Later that day, the JTWC began issuing advisories on the system, assigning the designation of 15W. Early the next day, 15W had intensified into a tropical storm by both agencies, with the JMA prompting the name Namtheun. The PAGASA however started issuing advisories on Namtheun and considered it as a tropical depression and gave the local name Enteng. Despite the overall structure of the storm being described to be "midget" with a very small but compact LLCC, Namtheun had begun a phase of rapid intensification and a pinhole eye developed; therefore, the JTWC upgraded Namtheun to a Category 1 typhoon. The JMA, though, upgraded Namtheun only to a severe tropical storm at that time. Later that day, PAGASA had declared that the storm had exited its area of responsibility as a severe tropical storm. By September 2, rapid intensification ensued as it was reported that Namtheun was located over a region of warm sea surface temperatures of 30 degrees Celsius with high ocean heat content, therefore prompting the JMA to classify it to a typhoon. Namtheun developed a pinhole eye 8 nmi (15 km; 9.2 mi) across and reached its peak strength as a Category 3 typhoon with 1-minute sustained winds of 185 km/h (115 mph); the JMA though declared its 10-minute peak strength early on September 3 with a minimum barometric pressure of 955 millibars. By that time, Namtheun was depicted with significantly weakened structure and a dissipation of its eye, therefore the JTWC downgraded Namtheun rapidly to a strong Category 1. On September 4, Namtheun had weakened to a tropical storm due to diminishing convection, caused by high southwesterly wind shear. After making landfall over in Nagasaki, Kyushu, both the JMA and JTWC issued its final advisory as a tropical depression early on September 5. On September 5, the JMA started to monitor a tropical depression, that had developed over the Japanese prefecture of Okinawa. The depression was located within a favourable environment for further development, with very warm sea surface temperatures and low vertical wind shear. Over the next day the system moved north-eastwards towards the Japanese Mainland, before it was classified as a tropical storm and named Malou by the JMA during September 6. However, the JTWC classified Malou as a hybrid system, with both subtropical and tropical characteristics. They also noted that the convective development around the system's low level circulation centre was being hindered, as the subtropical westerlies were located over the system. During September 7, the system started to accelerate northwards, before the JMA issued their final advisory on the system as Malou became an extratropical cyclone. On September 8, a tropical depression formed in a region of low wind shear, steered by ridges to the north and southwest, with warm water temperatures and outflow from the south. The system reached tropical storm strength by 06:00 UTC on September 10, receiving the name Meranti. Rainbands and a central dense overcast continued to evolve as the wind shear decreased. By early on September 12, Meranti reached typhoon status. A small eye 9 km (5.6 mi) across developed within the spiraling thunderstorms, and Meranti started rapidly intensifying. Meranti quickly attained estimated 1-minute sustained winds of 285 km/h (180 mph), equivalent to Category 5 on the Saffir–Simpson scale. Meranti gradually reached its peak intensity on September 13 while passing through the Luzon Strait. The JMA estimated peak 10-minute sustained winds of 220 km/h (140 mph) and a minimum barometric pressure of 890 hPa (mbar; 26.28 inHg), while the JTWC estimated peak 1-minute sustained winds of 315 km/h (195 mph). Based on the JMA pressure estimate, Meranti was among the most intense tropical cyclones. The JTWC wind estimate made Meranti the strongest tropical cyclone worldwide in 2016, surpassing Cyclone Winston, which had winds of 285 km/h (180 mph) when it struck Fiji in February. Late on September 13, the storm made landfall on the 83 km2 (32 sq mi) island of Itbayat in the Philippine province of Batanes while near its peak intensity. At around 03:05 CST on September 15 (19:05 UTC on September 14), Meranti made landfall over Xiang'an District, Xiamen in Fujian, China with measured 2-minute sustained winds of 173 km/h (108 mph), making it the strongest typhoon to ever make landfall in China's Fujian Province. During September 8, the JTWC started to monitor a tropical disturbance that had developed about 1,210 km (750 mi) to the west of Iwo To. Moving northward in a few days, the JTWC assessed that the system had strengthened into Tropical Depression 17W. Despite its LLCC remaining small, satellite imagery showed that 17W produced persistent convection and some spiral banding. Later, drier air surrounded the depression as it was now firmly embedded with the west-southwesterly flow ahead of the mid-latitude frontal zone. The JTWC issued their final advisory on 17W on September 12, as the system was rapidly deteriorating due to vertical wind shear, and weakened into a remnant low. Its remnants was later absorbed by a front near the International Dateline, late on September 14. In the JMA's post-analysis, 17W was recognized as a tropical depression, and the system was first noted on September 10. On September 11, a tropical depression formed within an unfavourable environment for further development, about 860 km (535 mi) to the northeast of Ho Chi Minh City, Vietnam. Satellite imagery then showed that the LLCC of 19W was broad and defined with some deep convective banding. Its LLCC became exposed, though its deep convection remained in place. Although the JMA declared that 19W had strengthened into a tropical storm, the JTWC deemed the system to not have reached tropical storm intensity. Rai made landfall over Central Vietnam, about 94 km (59 mi) southeast of the city of Da Nang. Rai degraded to a tropical depression six hours later. Heavy rains in Central Vietnam and Northern Thailand caused flooding and the bursting of the Bung River 2 hydroelectricity plant in Quảng Nam province of Vietnam, which released 28 million cubic meters of water and washed away 2 workers. Four ships were sunk along central Vietnam's coastline and 2 others were left stranded, while 5 houses were completely destroyed and 275 others had their roofs torn off. Most of the damage occurred in Nghệ An Province due to flooding, amounting to about ₫748 billion (US$33.6 million). In total, Rai caused 12 deaths and damages amounting to ₫825 billion (US$37 million). On September 11, a tropical depression formed approximately 58 km (36 mi) south of Hagåtña, Guam. On becoming a tropical storm, it was named Malakas. By September 13, Malakas had improved in its organization and became a severe tropical storm thereafter. At the same time, Malakas had entered the Philippine area of Responsibility, with PAGASA assigning the local name Gener. Despite hindrance by the outflow of nearby Typhoon Meranti, Malakas intensified into a typhoon. On September 16, Malakas rapidly intensified into a Category 4 typhoon. Malakas reached its peak intensity with 1-minute sustained winds of 215 km/h (130 mph), 10-minute sustained winds of 175 km/h (110 mph), and a pressure of 930 hPa (27.46 inHg) by the following day. Shortly thereafter, its eye became cloud-filled and ragged, signalling the onset of weakening. After weakening to a Category 2 typhoon, Malakas reintensified to a Category 3 typhoon by September 19. Malakas then resumed weakening due to land interaction with Japan. By the following day, Malakas weakened below typhoon intensity, and became extratropical. At around 00:00 JST on September 20 (15:00 UTC on September 19), Malakas made landfall over the Ōsumi Peninsula in Japan. It subsequently crossed Cape Muroto at around 11:00 JST (02:00 UTC) and made landfall over Tanabe at around 13:30 JST (04:30 UTC). Megi originated as a tropical depression about 722 km (449 mi) east-southeast of Guam on September 21. The depression became a tropical storm by on September 23. On the following day, Megi intensified to a severe tropical storm. On developing an eye, Megi reached typhoon intensity. Shortly thereafter, Megi entered PAGASA's area of responsibility, and the local name Helen was assigned. After a day of slight intensification, Megi started to undergo an eyewall replacement cycle. From then on, Megi rapidly intensified as it neared the coast of Taiwan. Megi reached peak intensity as a Category 3 typhoon over Taiwan with 1-minute sustained winds of 205 km/h (125 mph), 10-minute sustained winds of 155 km/h (100 mph), and a minimum barometric pressure of 945 mbar late on September 26. Early on September 27, Megi made landfall over Hualien City, weakening due to land interaction. Megi made landfall over in Hui'an County of Quanzhou the next day. Megi continued deteriorating as it moved inland. On September 24, a weak tropical depression had developed approximately 1,445 km (898 mi) east-northeast of Guam. The system reached tropical storm status and was assigned the name Chaba late the next day. By September 30, Chaba had intensified into a severe tropical storm after deep convection had evolved into a banding feature, under very favorable conditions. During October 1, Chaba entered the Philippine area of responsibility, with PAGASA giving the local name Igme, as it started to move in a northwestward direction. Chaba became a typhoon after its organization and structure vastly improved. During the next day, Chaba began explosive intensification, reaching Category 5 super typhoon intensity with a sharp 5 nmi (9.3 km; 5.8 mi) wide eye. Chaba reached its peak intensity with 10-minute sustained winds of 215 km/h (130 mph), while 1-minute sustained winds were at 280 km/h (175 mph), and the minimum central pressure was 905 mbar. Thereafter, Chaba began to weaken as its core became asymmetric, due to strong wind shear. As it neared the coast of Busan, South Korea, Chaba transitioned into an extratropical cyclone. The storm left widespread damage across the southern regions of South Korea, killing at least 7 and leaving 4 others missing. Transportation was disrupted, with hundreds of flights canceled, while more than 200,000 households lost electricity. Chaba was the strongest typhoon to strike the country since Typhoon Sanba in 2012. A tropical disturbance entered the basin from the Central Pacific late on October 3 and on the following day, became a tropical depression approximately 1,333 km (829 mi) east-southeast of Wake Island. After moving westward for several days, 23W intensified into a tropical storm, with the JMA giving the name Songda. By October 9, an eye feature became apparent in microwave imagery, and Songda reached severe tropical storm intensity. Six hours later, Songda intensified into a typhoon. Songda started to undergo rapid deepening, while forming a ragged eye. Songda eventually reached its peak intensity as a Category 4 super typhoon, despite 25-30 kt vertical wind shear, with 10-minute sustained winds of 185 km/h (115 mph) and a minimum pressure of 925 mbar. Shortly thereafter, Songda rapidly weakened as the wind shear increased further, and its eye became cloud-filled. The JTWC issued its final advisory, classifying Songda as a rapidly-weakening Category 3-equivalent typhoon. The storm was embedded within the deep mid-latitude westerlies and located over waters cooler than 26 °C (79 °F). The JMA downgraded Songda to a severe tropical storm in its final advisory on October 13, and Songda subsequently transitioned into an extratropical cyclone. The extratropical remnant of Songda went on to affect the west coast of North America with heavy rain and winds. Shortly after Songda's formation, another tropical depression developed well east to the Babuyan Group of Islands. Later that day, PAGASA named the system Julian. Despite Julian's disorganised structure, conditions were favourable for development, with light to moderate wind shear and very warm sea surface temperatures. After a significant increase of convection, the system became a tropical storm, receiving the name Aere. Aere became a severe tropical storm the following day. Shortly thereafter, Aere reached itspeak intensity with 10-minute winds of 110 km/h (70 mph), just shy of typhoon strength. Upwelling induced weakening, and Aere weakened to a tropical storm. By October 10, Aere's LLCC became exposed due to southwesterly wind shear, and Aere degenerated to a tropical depression. The JMA tracked its remnants as it moved southwestward until it weakened to a low-pressure area late on October 11. On October 13, the well-marked low pressure area of Aere re-generated into a tropical depression, and was tracked by the JMA until it fully dissipated on October 14. Most of the damage was reported mainly in Vietnam, especially in the central region, where estimated damages for transport works were at 130 billion ₫ (US$5.83 million). A total of 25 houses were destroyed while 949 were damaged. In agriculture, 3.14 ha of rice and 11.5 ha of crops were damaged. In total, flooding by the storm caused ₫ 2.5 trillion (US$111 million) of damage. Sarika was first noted as a tropical depression located about 1,200 km (750 mi) east-southeast of Manila, Philippines. When 24W entered their area of responsibility, PAGASA assigned it the local name Karen. By October 13, images depicted a broad LLCC; sea surface temperatures were high, at 31 °C (88 °F). Hours later, the system became a tropical storm, with the JMA naming it as Sarika. Sarika continued organizing and reached severe tropical storm intensity. Several hours later, Sarika started to form an eye feature as it became a typhoon. The storm eventually reached its peak intensity as a Category 4 typhoon with 1-minute sustained winds of 215 km/h (130 mph) and a minimum barometric pressure of 935 mbar. Early on October 16, Sarika made landfall over in Baler, Aurora. Dramatic weakening occurred as Sarika traversed the islands. After moving westward rapidly for two days, Sarika weakened to a severe tropical storm as it made landfall over in Hainan. Sarika continued weakening as it made its final landfall over the border of Vietnam and China, and dissipated later that day. During October 14, the JMA and JTWC reported that a tropical depression had developed about 700 km (435 mi) within the Caroline Islands to the south of Guam. During that day the depressions low level circulation center rapidly consolidated, while bands of atmospheric convection built and wrapped into the center. As a result, both warning centers reported that the depression had developed into a tropical storm, early the next day with the JMA naming it as Haima. Early on October 15, the depression intensified into a tropical storm and was assigned the name Haima. At this point of time, Haima was located in a very favorable environment with very high ocean heat content, very low wind shear and warm SSTs. Three hours later, Haima intensified into a severe tropical storm. With very good radial outflow, and still being situated in an extremely favorable environment, Haima rapidly intensified into a Category 4 super typhoon. By the end of the time, PAGASA announced the Haima had entered their area of responsibility, assigning it the name Lawin. Haima continued to intensify, reaching Category 5 super typhoon status by late on October 18. On October 31, the JMA started to track a tropical depression about 287 km (178 mi) south of Guam. Late on November 2, organization had increased as the JTWC upgraded the system to a tropical depression with the identifier of 26W. The JMA, however, had upgraded 26W to a tropical storm, giving the name Meari early on the next day. With a rapidly consolidating LLCC, the JTWC followed suit of upgrading to a tropical storm. By November 4, now moving northward, feeder bands were covering its very broad and compact LLCC and therefore Meari intensified into a severe tropical storm. Hours later, deep convective banding with a central dense overcast (CDO) seen from satellite imagery prompted the JTWC and the JMA to upgrade Meari to a typhoon. On the next day, organization ensued with deep convection wrapping into its center and its CDO feature becoming more symmetric. Meari intensified into a Category 2 typhoon. During the course of November 6, Meari reached peak intensity only as a Category 2 with 10-minute sustained winds of 155 km/h (100 mph) and a minimum barometric pressure of 955 mbar. Later that day, Meari started to move northeastward rapidly with a strong poleward outflow as it started to interact with high vertical wind shear. The JTWC downgraded Meari to a Category 1. On November 7, the JTWC issued its final advisory on Meari due to the fact that its convective structure had became frontal, therefore it had already transitioned into an extratropical cyclone. The JMA followed suit three hours later. Meari's extratropical remnants was later absorbed by another but larger extratropical cyclone early on November 10. On November 2, a tropical depression formed west of Sabah, Malaysia. On November 5, it made landfall in southern Vietnam, and moved westwards until it dissipated on November 6. The depression exacerbated the torrential rains and heavy flooding that had impacted central and southern Vietnam since mid October, damaging more than 20,000 homes. A total of 15 people were killed and total damage reached ₫1.073 trillion (US$48.1 million) in Vietnam from November 1, though a total of 35 have been killed since the flooding from October. Residents say that the country had their worst flooding since 2011. On November 8, the JMA started to track a tropical depression that had formed several nautical miles to the east of the Mariana Islands. Later that day, the JTWC had started initiating advisories giving it the designation 27W. During the next day, the JMA upgraded 27W to a tropical storm, naming it Ma-on, due to deep curved convection despite the system's LLCC being exposed. The JTWC followed suit, upgrading it to a tropical storm after the system became more symmetrical with deep convection over in an area of low wind shear. Later that day, Ma-on reached its maximum intensity with 10-minute sustained winds of 75 km/h (45 mph) and a minimum pressure of 1002 mbar. Despite additional strengthening being forecast, its LLCC became exposed as favorable conditions started to deteriorate. Both agencies downgraded Ma-on to a tropical depression and issued their final advisories, although, the JMA tracked Ma-on until November 13. During November 9, the JMA reported that a tropical depression had developed, about 455 km (285 mi) to the east-northeast of Kwajalein Atoll in the Marshall Islands. Over the next couple of days, the system moved westwards through the Marshall Islands, where it gradually consolidated further within a favourable environment for further development. During November 11, the JTWC initiated advisories and designated the system as Tropical Depression 28W, after atmospheric convection had started to wrap into the weekly defined low level circulation centre. However, as the system was located within an area of low to moderate vertical wind shear, atmospheric convection associated with the system quickly dissipated. The system subsequently degenerated into a tropical wave, before it was last noted by both warning centers during November 12. During November 23, PAGASA started to monitor a tropical depression that had developed about 420 km (260 mi) to the east of Hinatuan, Surigao del Sur. The JMA, however, tracked the depression on November 24. The JTWC would shortly follow suit, designating it as "29W". Over the rest of the day, the depression was gradually organizing under favorable conditions, before the PAGASA reported that Tropical Depression "Marce" had made landfall over Siargao Island around 12:00 UTC (8:00 p.m. PST) of the same day. The JTWC would also follow suit shortly. On 12:00 UTC of November 25, the JMA reported that "Marce" became a tropical storm while traversing the Visayan Sea, naming it as "Tokage". Around 21:00 UTC of the same day, the PAGASA reported that "Marce" became a tropical storm while nearing Panay Island. Tokage would emerge into the Mindoro Strait while making its second landfall and traverse on the Calamian Islands. Shortly after emerging into the West Philippine Sea on November 26, JMA reported that Tokage briefly reached its peak intensity of 95 km/h (50 knots) and a pressure of 992 hpa. The JTWC would follow suit, upgrading Tokage to a category 1 typhoon, reaching its peak intensity of 135 km/h (75 knots) and a pressure of 967 hPa, while weakening to a tropical storm at 12:00 UTC the same day. Around 03:00 UTC (11:00 a.m PST) of November 26, PAGASA reported that Tokage slightly intensified while the storm is re-intensifying in the West Philippine Sea. On the next day, the JTWC reported that Tokage has regained its category 1 status, and had made its secondary peak intensity with 145 km/h (80 knots) and a pressure of 963 hPa. Afterwards, Tokage rapidly weakened below typhoon intensity on 12:00 UTC the same day, below tropical storm intensity at 18:00 UTC, and both agencies discontinued advisories on 00:00 UTC of November 28. The PAGASA, however, discontinued advisories for Tropical Depression "Marce" 3 hours later, around 11 a.m. PST. A total of 2,980 families were affected during Tokage's passing, and only 712 families evacuated to their designated evacuation centers and 67 families were served outside. A total of 46 municipalities and 9 cities on the regions MIMAROPA, 6, 7, 8, 10, NIR and CAR suspended their classes during the storm, a total of 32 flights were cancelled, a total of 6 transmission lines were affected in Visayas, 2 landslides were reported on Sogod, Southern Leyte and Baybay, Leyte, 8 flooding incidents were reported around Oriental Mindoro, Romblon, and Negros Occidental. A total of 16 houses were destroyed during the storm (totally or partially), 40 hectares of palay to tillering stage and 15 hectares in ripening stage were damaged on some parts of Iloilo, and a total of ₱1,500,000 ($28,788 USD) as reported damages to infrastructure. In response, the DSWD provided a total of ₱24,9049.57 ($47,79.58 USD) to the affected families on Surigao del Norte and Surigao del Sur. Nock-ten was first noted as a tropical depression on December 21, and quickly organized into a tropical storm. The system reached severe tropical storm intensity the following day, and then typhoon intensity the day after. Around this time, a well-defined eye formed, and the storm began rapidly intensifying. Nock-ten reached its peak intensity as a Category 5-equivalent super typhoon with 1-minute sustained winds of 260 km/h (160 mph) on December 25, becoming the strongest tropical cyclone recorded on Christmas Day anywhere in the world since at least 1960 in terms of 1-minute sustained winds. Shortly thereafter, land interaction imparted weakening, with warming cloud tops, and the typhoon made its first landfall over Catanduanes as a Category 4-equivalent super typhoon with 1-minute sustained winds of 250 km/h (155 mph). Nock-ten emerged into the South China Sea as a minimal typhoon, where strong vertical wind shear associated with a cold surge event led to continued weakening, with the low-level circulation center becoming exposed. The JMA issued its final advisory on the system late on December 27, and the JTWC followed suit early on December 28. On June 23, the JMA started to monitor a broad tropical depression that had developed, about 420 km (260 mi) to the southwest of Manila in the Philippines. The system was located within a favourable environment for further development, but was not expected to significantly develop any further, as an upper level low was expected to move over the system. Over the next couple of days the system moved north-westwards, before the system dissipated and became a remnant area of low pressure during June 25. However, the system's remnants were tracked until they made landfall on central Vietnam during June 27. The system was responsible for some heavy rainfall in Central and Southern Vietnam. The JMA upgraded a low-pressure area east of Taiwan to a tropical depression on August 6. The system made landfall over eastern China on August 9. On August 10, the JMA reported that a tropical depression had developed, about 300 km (185 mi) to the southeast of Ishigaki Island. Over the next day the system moved north-westwards, within a marginal environment for further development, before it passed over northern Taiwan and moved into the East China Sea. The system subsequently continued moved westwards, before it was last noted as it made landfall on southern China later that day. During August 12 a tropical depression developed near the coast of Taiwan, about 160 km (100 mi) to the southeast of Taipei. The system subsequently made landfall on the island, before it was last noted during the next day as it dissipated over Taiwan. A tropical depression briefly appeared over the Gulf of Tonkin early on August 16. A tropical depression persisted east of the Northern Mariana Islands in the afternoon of August 17. The system was last noted early on the next day and led to the formation of Tropical Storm Kompasu. During August 24, two tropical depressions briefly developed; one in the South China Sea, and one over to the northeast of the Mariana Islands. However, the system over the South China Sea briefly developed into a tropical depression twice on August 25 and 27. A tropical depression formed north of Wake Island early on August 30, and it became extratropical on the next day. On September 10, the JMA had briefly monitored a tropical depression to the east of Okinawa. On October 15, the JMA reported that a tropical depression had entered the basin from the Central Pacific. The system moved in a westward direction until dissipating several hours later on the same day. On November 1, the JMA started to track a tropical depression about 704 km (437 mi) east of Andersen Air Force Base, Guam. Later that same day, the JMA started issuing advisories on the depression whilst the JTWC had issued a Tropical Cyclone Formation Alert, though they canceled it early on November 2. The system moved northward until the JMA issued its final advisory as it interacted with the outer rainbands of the nearby Typhoon Meari and became extratropical on November 5. During December 10, the JMA started to monitor a tropical depression that had developed about 415 km (260 mi) to the southeast of Ho-Chi-Minh City in Southern Vietnam. Over the next couple of days, the system moved slowly westwards without developing any further, before it made landfall on and dissipated over Southern Vietnam during December 13. The depression had caused torrential rains and heavy flooding since mid December in Central and Southern Vietnam, where at least 24 people were killed and total damages had reached to at least ₫1.21 trillion (US$53.4 million) in Vietnam. On December 27, the JMA briefly monitored on a tropical depression located near Chuuk, which dissipated later on the same day. 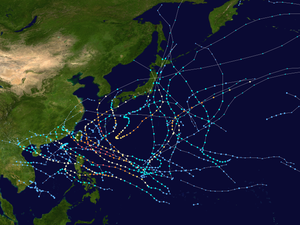 During the season 26 tropical storms developed in the Western Pacific and each one was named by the JMA, when the system was judged to have 10-minute sustained windspeeds of 65 km/h (40 mph). The JMA selected the names from a list of 140 names, that had been developed by the 14 members nations and territories of the ESCAP/WMO Typhoon Committee. During the season, the name Rai was used for the first time after it was replaced by the name Fanapi in the 2010 season. After the season the Typhoon Committee retired the names Meranti, Sarika, Haima and Nock-ten from the naming lists, and in February 2018, the names were subsequently replaced with Nyatoh, Trases, Mulan, and Hinnamnor for future seasons, respectively. During the season PAGASA used its own naming scheme for the 14 tropical cyclones, that either developed within or moved into their self-defined area of responsibility. The names were taken from a list of names, that was last used during 2012 and are scheduled to be used again during 2020. All of the names are the same except for Pepito, which replaced the name Pablo after it was retired. The name Gardo was replaced by Gomer after Gardo was added to PAGASA's main list replacing Glenda, which was retired after the 2014 season. After the season the names Karen, Lawin and Nina were retired by PAGASA, as they had caused over ₱1 billion in damages. They were subsequently replaced on the list with the names Kristine, Leon and Nika. This table will list all the storms that developed in the northwestern Pacific Ocean west of the International Date Line and north of the equator during 2016. It will include their intensity, duration, name, areas affected, deaths, and damage totals. Classification and intensity values will be based on estimations conducted by the JMA. All damage figures will be in 2016 USD. Damages and deaths from a storm will include when the storm was a precursor wave or an extratropical cyclone. ^ a b c Saunders, Mark; Lea, Adam (May 6, 2015). Extended Range Forecast for Northwest Pacific Typhoon Activity in 2016 (PDF) (Report). Tropical Storm Risk Consortium. Retrieved May 7, 2016. ^ a b Saunders, Mark; Lea, Adam (July 6, 2015). July Forecast Update for Northwest Pacific Typhoon Activity in 2016 (PDF) (Report). Tropical Storm Risk Consortium. Retrieved July 6, 2016. ^ a b Saunders, Mark; Lea, Adam (August 8, 2015). July Forecast Update for Northwest Pacific Typhoon Activity in 2016 (PDF) (Report). Tropical Storm Risk Consortium. Retrieved August 8, 2016. ^ a b c d Malano, Vicente B (January 8, 2016). January — June 2016 (Seasonal Climate Outlook). PAGASA. Archived from the original on January 22, 2016. ^ a b Cheng, Ming-Dean (June 28, 2016). "Less Typhoons due to La Niña, While Two to Four Expected to Hit Taiwan in 2016" (doc) (Press release). Taiwan Central Weather Bureau. Retrieved June 28, 2016. ^ a b c d Malano, Vicente B (July 15, 2016). July — December 2016 (Seasonal Climate Outlook). Philippine Atmospheric Geophysical and Astronomical Services Administration. Archived from the original on July 31, 2016. ^ Annual Tropical Cyclone Report 2016 (PDF) (Report). United States Joint Typhoon Warning Center. July 21, 2017. Archived from the original (PDF) on August 9, 2017. Retrieved July 27, 2017. ^ Chi-ming, Shun (March 15, 2016). "Speech by Mr Shun Chi-ming, Director of the Hong Kong Observatory March 15, 2016" (PDF). Hong Kong Observatory. Archived (PDF) from the original on April 3, 2016. Retrieved April 3, 2016. ^ a b c "The Seasonal forecast of Thailand during the Rainy Season of 2016". Thai Meteorological Department. April 25, 2016. Archived from the original on May 8, 2016. Retrieved May 8, 2016. ^ Dave Ornauer (August 28, 2016). "Lionrock could give Tokyo area another drenching". Stars and Stripes. Retrieved August 28, 2016. ^ "Typhoon Chaba leaves 7 dead, 3 missing in southern S. Korea". Yonhap News. 6 October 2016. Retrieved 7 October 2016. ^ Bob Henson (October 14, 2016). "Potential once-in-a-decade windstorm takes shape for Pacific Northwest". Weather Ungerground. Retrieved October 14, 2016. ^ "Mưa ở Quảng Bình là 'kỷ lục chưa từng có' - VnExpress". vnexpress.net. Retrieved November 13, 2016. ^ a b c "Tình hình kinh tế — xã hội 10 tháng đầu năm 2016" (in Vietnamese). General Statistics of Vietnam. October 29, 2016. Archived from the original on November 13, 2016. Retrieved November 13, 2016. ^ a b Klotzbach, Phil (December 25, 2016). "#Nockten's current intensity of 155 mph is strongest for TC anywhere around the globe on Christmas (UTC time) on record (since 1960)". Retrieved December 27, 2016. ^ a b c Lam, Linda; Erdman, Jon (December 26, 2016). "Super Typhoon Nock-Ten (Nina), the Most Intense Christmas Tropical Cyclone in 56 Years, Hammers the Philippines". The Weather Channel. Retrieved December 27, 2016. ^ Young, Steve (June 29, 2016). "Monthly Global Tropical System Tracks - May 2016". Australian Severe Weather. Retrieved June 29, 2016. ^ a b c d e "Tropical Depression May 26-27, 2016". Hong Kong Observatory. June 2016. Archived from the original on June 26, 2016. Retrieved June 26, 2016. ^ Shaoyi, Jiang (June 2016). "Torrential rainfall continues to batter S. China". CCTV.Com. Archived from the original on June 26, 2016. Retrieved June 26, 2016. ^ a b c d e f g h i j CMA (October 27, 2016). Member Report: China (PDF). ESCAP/WMO Typhoon Committee. ESCAP/WMO Typhoon Committee. pp. 1–2. Archived from the original (PDF) on March 6, 2017. Retrieved October 30, 2016. ^ "JMA WWJP25 Warning and Summary June 26, 2016 06z". Japan Meteorological Agency. June 26, 2016. Archived from the original on June 28, 2016. Retrieved June 28, 2016. ^ Severe Weather Bulletin No. 01 re Tropical Depression "AMBO" (PDF) (Report). National Disaster Risk Reduction and Management Council. June 26, 2016. Retrieved February 9, 2019. ^ a b "Tropical Cyclone Formation Alert June 26, 2016 00z". United States Joint Typhoon Warning Center. June 26, 2016. Archived from the original on July 4, 2016. ^ Severe Weather Bulletin No. 05 (Final) re Tropical Depression "AMBO" (PDF) (Report). National Disaster Risk Reduction and Management Council. June 27, 2016. Retrieved February 9, 2019. ^ a b c d Young, Steve (August 8, 2016). "Monthly Global Tropical System Tracks - June 2016". Australian Severe Weather. Retrieved August 21, 2016. ^ "Significant Tropical Weather Advisory for the Western and South Pacific Oceans June 27, 2016 00z". United States Joint Typhoon Warning Center. Archived from the original on July 4, 2016. Retrieved August 21, 2016. ^ a b c d e f g "RSMC Tropical Cyclone Best Track 1601 NEPARTAK (1601)". Japan Meteorological Agency. August 22, 2016. ^ "Significant Tropical Weather Advisory for the Western and South Pacific Oceans July 15, 2016 14z". United States Joint Typhoon Warning Center. Archived from the original on August 21, 2016. Retrieved August 21, 2016. ^ Severe Weather Bulletin No. 1 re Typhoon "NEPARTAK" (PDF) (Report). National Disaster Risk Reduction and Management Council. July 5, 2016. Retrieved February 9, 2019. ^ "69 injured in Taitung as Typhoon Nepartak batters Taiwan". Focus Taiwan. July 8, 2016. Retrieved July 8, 2016. ^ Yang Shu-min; Chu Tze-wei; Lilian Wu (July 9, 2016). "Typhoon causes estimated NT$800 million in agricultural losses". Taipei, Taiwan: Focus Taiwan. Retrieved July 9, 2016. ^ Fei Fei (July 11, 2016). "Typhoon Nepartak leaves 9 dead, 18 missing in southeast China". CRI English. Retrieved July 11, 2016. ^ "Typhoon Nepartak leaves 10 dead, 11 missing in E China county". Fuzhou, China: Xinhua. July 11, 2016. Retrieved July 12, 2016. ^ a b c "Significant Tropical Weather Advisory for the Western and South Pacific Oceans July 14, 2016 06z". United States Joint Typhoon Warning Center. July 14, 2016. Archived from the original on August 1, 2016. ^ "Significant Tropical Weather Advisory for the Western and South Pacific Oceans July 15, 2016 14z". United States Joint Typhoon Warning Center. Archived from the original on July 17, 2016. Retrieved July 31, 2016. ^ "JMA WWJP25 Warning and Summary July 15, 2016 00z". Japan Meteorological Agency. October 20, 2015. Archived from the original on October 20, 2015. Retrieved July 31, 2016. ^ a b "JTWC Prognostic Reasoning For Tropical Depression 03W July 17, 2016 09z". United States Joint Typhoon Warning Center. Archived from the original on July 18, 2016. Retrieved July 17, 2016. ^ "Tropical Depression 03W Warning July 17, 2016 15z". United States Joint Typhoon Warning Centre. July 17, 2016. Archived from the original on July 18, 2016. ^ "JMA WWJP25 Warning and Summary July 20, 2016 06z". Japan Meteorological Agency. July 20, 2016. Archived from the original on August 1, 2016. Retrieved August 2, 2016. ^ a b c Young, Steve (August 20, 2016). "Monthly Global Tropical System Tracks - July 2016". Australian Severe Weather. Retrieved August 20, 2016. ^ a b "Significant Tropical Weather Advisory for the Western and South Pacific Oceans July 22, 2016 06z". United States Joint Typhoon Warning Center. July 22, 2016. Archived from the original on July 25, 2016. ^ a b c d Tropical Storm Lupit (RSMC Tropical Cyclone Best Track). Japan Meteorological Agency. August 23, 2016. Archived from the original on August 24, 2016. Retrieved August 24, 2016. ^ a b "JTWC Prognostic Reasoning For Tropical Depression 04W July 23, 2016 15z". United States Joint Typhoon Warning Center. Archived from the original on July 25, 2016. Retrieved August 6, 2016. ^ "JTWC Prognostic Reasoning For Tropical Depression 04W July 24, 2016 03z". United States Joint Typhoon Warning Center. Archived from the original on July 25, 2016. Retrieved August 6, 2016. ^ a b c d e "Severe Tropical Storm Mirinae (1603) July 25-28, 2016". Hong Kong Observatory. August 12, 2016. Archived from the original on August 17, 2016. Retrieved August 17, 2016. ^ "Significant Tropical Weather Advisory for the Western and South Pacific Oceans July 25, 2016 02z". United States Joint Typhoon Warning Center. July 25, 2016. Archived from the original on July 25, 2016. ^ "台风公报" (in Chinese). National Meteorological Center. July 26, 2016. Archived from the original on July 26, 2016. Retrieved July 26, 2016. ^ "JTWC Prognostic Reasoning For Tropical Storm 05W July 27, 2016 15z". United States Joint Typhoon Warning Center. Archived from the original on July 27, 2016. Retrieved August 17, 2016. ^ "Natural disasters kill 612 in China in July". Xinhua. August 10, 2016. Retrieved November 13, 2016. ^ "Ten killed, missing as storm Mirinae pounds northern Vietnam". Tuoi Tre News. Tuoi Tre. Retrieved July 31, 2016. ^ a b c "Phó Thủ tướng chỉ đạo ứng phó thiên tai, bão lũ" (in Vietnamese). Vietnam Government. August 8, 2016. Retrieved August 8, 2016. ^ "JMA WWJP25 Warning and Summary July 28, 2016 12z". Japan Meteorological Agency. July 28, 2016. Archived from the original on July 28, 2016. Retrieved August 1, 2016. ^ "Significant Tropical Weather Advisory for the Western and South Pacific Oceans July 28, 2016 13z". United States Joint Typhoon Warning Center. Archived from the original on July 28, 2016. Retrieved August 1, 2016. ^ "Tropical Cyclone Formation Alert July 29, 2016 02z". United States Joint Typhoon Warning Center. Archived from the original on August 1, 2016. Retrieved August 1, 2016. ^ "Severe Weather Bulletin #1: Tropical Cyclone Alert: Tropical Depression Carina". Philippine Atmospheric, Geophysical and Astronomical Services Administration. July 29, 2016. Archived from the original on August 1, 2016. Retrieved August 1, 2016. ^ "At 1:20 pm today, #CarinaPH has made landfall over Cabutunan point (Baggao-Gattaran area)". Twitter. PAGASA. July 31, 2016. Retrieved August 2, 2016. ^ "今年第4号台风"妮妲"今日凌晨在广东深圳登陆". National Meteorological Center. August 1, 2016. Archived from the original on August 2, 2016. Retrieved August 2, 2016. ^ a b Severe Tropical Storm Lupit (RSMC Tropical Cyclone Best Track). Japan Meteorological Agency. September 15, 2016. Archived from the original on September 15, 2016. Retrieved September 17, 2016. ^ a b "Significant Tropical Weather Advisory for the Western and South Pacific Oceans August 2, 2016 06z". United States Joint Typhoon Warning Center. August 2, 2016. Archived from the original on August 2, 2016. Retrieved September 17, 2016. ^ a b c d Tropical Storm Conson (RSMC Tropical Cyclone Best Track). Japan Meteorological Agency. September 15, 2016. Archived from the original on September 15, 2016. Retrieved September 15, 2016. ^ "JTWC Prognostic Reasoning For Tropical Depression 08W August 8, 2016 09z". United States Joint Typhoon Warning Center. Archived from the original on August 11, 2016. Retrieved September 21, 2016. ^ "Marine Weather Warning for GMDSS Metarea XI 2016-08-11T06:00:00Z". WIS Portal – GISC Tokyo. Japan Meteorological Agency. August 11, 2016. Retrieved August 11, 2016. ^ "平成２８年　台風第７号に関する情報　第４２号" (in Japanese). Japan Meteorological Agency. August 17, 2016. Archived from the original on August 17, 2016. Retrieved August 17, 2016. ^ "平成28年台風第7号による被害状況" (in Japanese). Ministry of Agriculture, Forestry and Fisheries. April 14, 2017. Retrieved April 16, 2017. ^ a b Tropical Storm Dianmu (RSMC Tropical Cyclone Best Track). Japan Meteorological Agency. September 21, 2016. Archived from the original on September 21, 2016. Retrieved September 21, 2016. ^ "Tropical Storm Dianmu hits northern Vietnam". Tuoi Tre News. Retrieved August 19, 2016. ^ a b "Marine Weather Warning for GMDSS Metarea XI 2016-08-17T12:00:00Z". WIS Portal – GISC Tokyo. Japan Meteorological Agency. August 17, 2016. Retrieved August 17, 2016. ^ "RSMC Tropical Cyclone Advisory 190600". Japan Meteorological Agency. August 19, 2016. Archived from the original on August 19, 2016. Retrieved August 22, 2016. ^ "Prognostic Reasoning for Tropical Storm 10W (Mindulle) Warning Nr 07". Joint Typhoon Warning Center. August 19, 2016. Archived from the original on August 19, 2016. Retrieved August 22, 2016. ^ "Prognostic Reasoning for Tropical Storm 10W (Mindulle) Warning Nr 11". Joint Typhoon Warning Center. August 20, 2016. Archived from the original on August 20, 2016. Retrieved August 22, 2016. ^ "RSMC Tropical Cyclone Advisory 210600". Japan Meteorological Agency. August 21, 2016. Archived from the original on August 21, 2016. Retrieved August 22, 2016. ^ "Prognostic Reasoning for Tropical Storm 10W (Mindulle) Warning Nr 15". Joint Typhoon Warning Center. August 21, 2016. Archived from the original on August 21, 2016. Retrieved August 22, 2016. ^ "Prognostic Reasoning for Tropical Storm 10W (Mindulle) Warning Nr 17". Joint Typhoon Warning Center. August 21, 2016. Archived from the original on August 21, 2016. Retrieved August 22, 2016. ^ "RSMC Tropical Cyclone Advisory 211800". Japan Meteorological Agency. August 21, 2016. Archived from the original on August 21, 2016. Retrieved August 22, 2016. ^ "平成２８年　台風第９号に関する情報　第３７号" (in Japanese). Japan Meteorological Agency. August 22, 2016. Archived from the original on August 22, 2016. Retrieved August 22, 2016. ^ a b "Significant Tropical Weather Advisory for the Western and South Pacific Oceans August 15, 2016 01z". United States Joint Typhoon Warning Center. Archived from the original on August 15, 2016. Retrieved August 27, 2016. ^ "Marine Weather Warning for GMDSS Metarea XI 2016-08-16T12:00:00Z". WIS Portal – GISC Tokyo. Japan Meteorological Agency. August 16, 2016. Retrieved August 16, 2016. ^ "Typhoon 'Dindo' enteres PAR, LPA Over East of PH". Inquirer.net. August 27, 2016. Retrieved August 24, 2016. ^ "Powerful Typhoon Likely to Slam Northeastern Japan". JIJI.com. JIJI Press. Retrieved 30 August 2016. ^ "平成２８年　台風第１０号に関する情報　第１１５号" (in Japanese). Japan Meteorological Agency. August 30, 2016. Archived from the original on August 30, 2016. Retrieved August 30, 2016. ^ "Typhoon Hits Northern Japan, Threatening to Bring Floods". Associated Press. Retrieved 30 August 2016 – via The New York Times. ^ a b c Tropical Storm Kompasu (RSMC Tropical Cyclone Best Track). Japan Meteorological Agency. September 27, 2016. Archived from the original on September 27, 2016. Retrieved September 27, 2016. ^ "Typhoon dumps heavy rain on northern Japan". Saudi Gazette. Retrieved August 28, 2016. ^ "Marine Weather Warning for GMDSS Metarea XI 2016-08-31T00:00:00Z". WIS Portal – GISC Tokyo. Japan Meteorological Agency. August 31, 2016. Archived from the original on 2016-09-18. Retrieved August 31, 2016. ^ "LPA develops into tropical depression". Philstar. September 1, 2016. ^ "Severe Tropical Storm Enteng leaves PAR". Rappler. September 1, 2016. ^ "Tropical Cyclone Advisory for Analysis and Forecast September 5, 2016 12z". Japan Meteorological Agency. September 5, 2016. Archived from the original on September 5, 2016. Retrieved September 5, 2016. ^ "Tropical Cyclone Advisory for Analysis and Forecast September 6, 2016 00z". Japan Meteorological Agency. September 6, 2016. Archived from the original on September 7, 2016. ^ "Significant Tropical Weather Advisory for the Western and South Pacific Oceans July 14, 2016 06z". United States Joint Typhoon Warning Center. July 14, 2016. Archived from the original on September 7, 2016. ^ "Tropical Cyclone Advisory for Analysis and Forecast September 7, 2016 18z". Japan Meteorological Agency. September 7, 2016. Archived from the original on September 8, 2016. ^ "RSMC Tropical Cyclone Advisory". Japan Meteorological Agency. Archived from the original on September 9, 2016. Retrieved September 12, 2016. ^ Prognostic Reasoning for Tropical Depression 16W (Sixteen) Warning NR 001 (Report). Joint Typhoon Warning Center. September 8, 2016. Archived from the original on September 9, 2016. Retrieved September 12, 2016. ^ "TS 1614 (Meranti) Upgraded from TD". Japan Meteorological Agency. Archived from the original on September 10, 2016. Retrieved September 12, 2016. ^ Prognostic Reasoning for Tropical Storm 16W (Meranti) Warning NR 009 (Report). Joint Typhoon Warning Center. September 10, 2016. Archived from the original on September 9, 2016. Retrieved September 12, 2016. ^ "TY 1614 (Meranti) Upgraded from TS". Japan Meteorological Agency. Archived from the original on September 11, 2016. Retrieved September 12, 2016. ^ Prognostic Reasoning for Typhoon 16W (Meranti) Warning NR 014 (Report). Joint Typhoon Warning Center. September 12, 2016. Archived from the original on September 12, 2016. Retrieved September 12, 2016. ^ Prognostic Reasoning for Typhoon 16W (Meranti) Warning NR 016 (Report). Joint Typhoon Warning Center. September 12, 2016. Archived from the original on September 13, 2016. Retrieved September 12, 2016. ^ "RSMC Tropical Cyclone Advisory". Japan Meteorological Agency. September 13, 2016. Archived from the original on September 13, 2016. Retrieved September 17, 2016. ^ Bob Hensen; Jeff Masters (September 13, 2016). "Taiwan, China Brace for Cat 5 Meranti; TS Ian Churns Through Open Atlantic". WeatherUnderground. Retrieved September 13, 2016. ^ Smith, Nicola (14 September 2016). "Typhoon Meranti: fears for tiny Philippine island in eye of a megastorm". The Guardian. Taipei. Retrieved 14 September 2016. ^ "中央气象台15日3时20分发布台风登陆消息" (in Chinese). National Meteorological Center. September 14, 2016. Archived from the original on September 14, 2016. Retrieved September 14, 2016. ^ "Typhoon Meranti lashes China after pounding Taiwan". Sechylles News. Agence France-Presse. Retrieved 15 September 2016. ^ a b "日々の天気図 2016年9月" (PDF) (in Japanese). Japan Meteorological Agency. Retrieved December 22, 2016. ^ Tropical Storm Rai (RSMC Tropical Cyclone Best Track). Japan Meteorological Agency. October 24, 2016. Archived from the original on October 24, 2016. Retrieved October 30, 2016. ^ "Significant Tropical Weather Advisory for the Western and South Pacific Oceans September 11, 2016 00z". United States Joint Typhoon Warning Center. September 11, 2016. Archived from the original on September 11, 2016. ^ "Dam burst sweeps 2 people away in Vietnam". World Bulletin. September 14, 2016. Retrieved 17 September 2016. ^ "7 injured, 280 houses damaged as Storm Rai crosses central Vietnam". Tuổi Trẻ. September 14, 2016. Retrieved September 17, 2016. ^ "平成２８年　台風第１６号に関する情報　第８９号" (in Japanese). Japan Meteorological Agency. September 19, 2016. Archived from the original on September 19, 2016. Retrieved September 19, 2016. ^ "平成２８年　台風第１６号に関する情報　第１０２号" (in Japanese). Japan Meteorological Agency. September 20, 2016. Archived from the original on September 20, 2016. Retrieved September 20, 2016. ^ "平成２８年　台風第１６号に関する情報　第１０６号" (in Japanese). Japan Meteorological Agency. September 20, 2016. Archived from the original on September 20, 2016. Retrieved September 20, 2016. ^ "Prognostic Reasoning for Typhoon 20W (Megi) Warning Nr 07". Joint Typhoon Warning Center. September 24, 2016. Archived from the original on September 25, 2016. Retrieved September 27, 2016. ^ "Severe Weather Bulletin #1". PAGASA. September 24, 2016. Archived from the original on September 27, 2016. Retrieved September 27, 2016. ^ "Prognostic Reasoning for Typhoon 20W (Megi) Warning Nr 15". Joint Typhoon Warning Center. September 26, 2016. Archived from the original on September 27, 2016. Retrieved September 27, 2016. ^ "Prognostic Reasoning for Typhoon 20W (Megi) Warning Nr 16". Joint Typhoon Warning Center. September 26, 2016. Archived from the original on September 27, 2016. Retrieved September 27, 2016. ^ "RSMC Tropical Cyclone Advisory 261800". Japan Meteorological Agency. September 26, 2016. Archived from the original on September 27, 2016. Retrieved September 27, 2016. ^ "海上陸上颱風警報第14報" (in Chinese). Central Weather Bureau. September 27, 2016. Archived from the original on September 27, 2016. Retrieved September 27, 2016. ^ "Prognostic Reasoning for Typhoon 20W (Megi) Warning Nr 19". Joint Typhoon Warning Center. September 27, 2016. Archived from the original on September 27, 2016. Retrieved September 27, 2016. ^ "台风"鲇鱼"已登陆福建 福建浙江台湾出现强风雨 闽浙赣粤等地将有暴雨或大暴雨" (in Chinese). National Meteorological Center. September 28, 2016. Archived from the original on September 28, 2016. Retrieved September 28, 2016. ^ "Typhoon claims six lives in South Korea". Financial Times Bangladesh. October 6, 2016. ^ "Đường bộ thiệt hại 130 tỷ đồng do mưa lũ". GIAO THÔNG PHÁT TRIỂN. October 17, 2016. ^ "25 người chết, 4 người mất tích do mưa lũ". Chính trị - Xã hội. October 17, 2016. ^ "Vietnam braces for Typhoon Sarika's arrival as number dead in flooding reaches 31". Chinapost. October 19, 2016. ^ "Typhoon Karen makes landfall in Aurora". Rappler. October 16, 2016. ^ a b "Prognostic Reasoning For Tropical Depression 25W Warning 1 October 14, 2016 21z". United States Joint Typhoon Warning Center. Archived from the original on October 15, 2016. Retrieved July 21, 2017. ^ "RSMC Tropical Cyclone Best Track: Typhoon Hamia". Japan Meteorological Agency. November 22, 2016. Archived from the original on November 22, 2016. Retrieved July 20, 2017. ^ "Tropical Depression 26W (Twenty-six) Warning Nr 001". Joint Typhoon Warning Center. November 2, 2016. Archived from the original on November 3, 2016. ^ "TS 1623 MEARI (1623) UPGRADED FROM TD". Japan Meteorological Agency. November 3, 2016. Archived from the original on November 3, 2016. ^ "Prognostic Reasoning for Tropical Storm 26W (Meari) Warning Nr 03". Joint Typhoon Warning Center. November 3, 2016. Archived from the original on November 4, 2016. ^ "Prognostic Reasoning for Tropical Storm 26W (Meari) Warning Nr 06". Joint Typhoon Warning Center. November 4, 2016. Archived from the original on November 4, 2016. ^ "STS 1623 MEARI (1623) UPGRADED FROM TS". Japan Meteorological Agency. November 4, 2016. Archived from the original on November 4, 2016. ^ "Prognostic Reasoning for Typhoon 26W (Meari) Warning Nr 09". Joint Typhoon Warning Center. November 4, 2016. Archived from the original on November 5, 2016. ^ "TY 1623 MEARI (1623) UPGRADED FROM STS". Japan Meteorological Agency. November 5, 2016. Archived from the original on November 5, 2016. ^ "Prognostic Reasoning for Typhoon 26W (Meari) Warning Nr 12". Joint Typhoon Warning Center. November 5, 2016. Archived from the original on November 5, 2016. ^ "TY 1623 MEARI (1623)". Japan Meteorological Agency. November 6, 2016. Archived from the original on November 7, 2016. ^ "Prognostic Reasoning for Typhoon 26W (Meari) Warning Nr 16". Joint Typhoon Warning Center. November 6, 2016. Archived from the original on November 7, 2016. ^ "Prognostic Reasoning for Typhoon 26W (Meari) Warning Nr 17". Joint Typhoon Warning Center. November 6, 2016. Archived from the original on November 7, 2016. ^ "Typhoon Meari (26W) Warning Nr 019". Joint Typhoon Warning Center. November 7, 2016. Archived from the original on November 7, 2016. ^ "DEVELOPING LOW FORMER TY 1623 MEARI (1623)". Japan Meteorological Agency. November 7, 2016. Archived from the original on November 7, 2016. ^ "Vietnam floods: deaths reported, tens of thousands of homes destroyed". The Guardian. October 16, 2016. ^ a b "Death Toll From Floods in Central Coastal Vietnam Reaches 15". Radio Free Asia. November 9, 2016. ^ "Vietnam Braces for Typhoon Sarika After Deadly Flooding". Wall Street Journal. October 15, 2016. Retrieved October 16, 2016. ^ a b c Young, Steve (December 11, 2016). "Monthly Global Tropical System Tracks — November 2016". Australian Severe Weather. Retrieved July 20, 2016. ^ a b "Prognostic Reasoning For Tropical Depression 28W Warning 1 November 11, 2016 03z". United States Joint Typhoon Warning Center. Retrieved July 20, 2017. ^ "Prognostic Reasoning For Tropical Depression 28W Warning 2 November 11, 2016 09z". United States Joint Typhoon Warning Center. Archived from the original on November 11, 2016. Retrieved July 20, 2017. ^ "Tropical Depression 28W Warning 6 November 12, 2016 09z". United States Joint Typhoon Warning Center. Archived from the original on November 12, 2016. Retrieved July 20, 2017. ^ Severe Weather Bulletin No. 01 re Tropical Depression "MARCE" (PDF) (Report). National Disaster Risk Reduction and Management Council. November 23, 2016. Retrieved February 9, 2019. ^ a b c d "bst2016.txt". Japan Meteorological Agency. Retrieved February 9, 2019. ^ a b c d e "bwp292016.txt". National Oceanic and Atmospheric Administration. November 14, 2017. Retrieved February 9, 2019. ^ Severe Weather Bulletin No. 10 re Tropical Depression "MARCE" (PDF) (Report). National Disaster Risk Reduction and Management Council. November 24, 2016. Retrieved February 9, 2019. ^ Severe Weather Bulletin No. 13 re Tropical Storm "MARCE" (PDF) (Report). National Disaster Risk Reduction and Management Council. November 25, 2016. Retrieved February 9, 2019. ^ Severe Weather Bulletin No. 17 re Tropical Storm "MARCE" (PDF) (Report). National Disaster Risk Reduction and Management Council. November 25, 2016. Retrieved February 9, 2019. ^ Severe Weather Bulletin No. 19 re Tropical Storm "MARCE" (PDF) (Report). National Disaster Risk Reduction and Management Council. November 25, 2016. Retrieved February 9, 2019. ^ Severe Weather Bulletin No. 19 re Tropical Storm "MARCE" (PDF) (Report). National Disaster Risk Reduction and Management Council. November 26, 2016. Retrieved February 9, 2019. ^ Severe Weather Bulletin No. 20 re Tropical Storm "MARCE" (PDF) (Report). National Disaster Risk Reduction and Management Council. November 26, 2016. Retrieved February 9, 2019. ^ Severe Weather Bulletin No. 22 re Tropical Storm "MARCE" (I.N. TOKAGE) (PDF) (Report). National Disaster Risk Reduction and Management Council. November 26, 2016. Retrieved February 9, 2019. ^ Severe Weather Bulletin No. 26 re Tropical Depression "MARCE" (I.N. TOKAGE) (PDF) (Report). National Disaster Risk Reduction and Management Council. November 28, 2016. Retrieved February 9, 2019. ^ SitRep No. 04 Preparedness Measures and Effects for Tropical Storm "MARCE" (I.N. TOKAGE) (PDF) (Report). National Disaster Risk Reduction and Management Council. November 27, 2016. Retrieved February 9, 2019. ^ "RSMC Tropical Cyclone Advisory 210000". Japan Meteorological Agency. December 21, 2016. Archived from the original on December 21, 2016. Retrieved December 27, 2016. ^ "RSMC Tropical Cyclone Advisory 211800". Japan Meteorological Agency. December 21, 2016. Archived from the original on December 22, 2016. Retrieved December 27, 2016. ^ "RSMC Tropical Cyclone Advisory 221800". Japan Meteorological Agency. December 22, 2016. Archived from the original on December 23, 2016. Retrieved December 27, 2016. ^ "RSMC Tropical Cyclone Advisory 231200". Japan Meteorological Agency. December 23, 2016. Archived from the original on December 23, 2016. Retrieved December 27, 2016. ^ "Prognostic Reasoning for Typhoon 30W (Nock-ten) Warning Nr 10". Joint Typhoon Warning Center. December 23, 2016. Archived from the original on December 23, 2016. Retrieved December 27, 2016. ^ "Prognostic Reasoning for Typhoon 30W (Nock-ten) Warning Nr 11". Joint Typhoon Warning Center. December 23, 2016. Archived from the original on December 23, 2016. Retrieved December 27, 2016. ^ "30W.NOCK-TEN Track File". Naval Research Laboratory. Retrieved December 27, 2016. ^ "Prognostic Reasoning for Typhoon 30W (Nock-ten) Warning Nr 17". Joint Typhoon Warning Center. Archived from the original on December 25, 2016. ^ "At 06:30 PM today,Typhoon #NinaPH has made landfall over Catanduanes". Twitter. PAGASA. December 25, 2016. Retrieved December 27, 2016. ^ "Prognostic Reasoning for Typhoon 30W (Nock-ten) Warning Nr 21". December 26, 2016. Archived from the original on December 27, 2016. Retrieved December 27, 2016. ^ "RSMC Tropical Cyclone Advisory 260900". Japan Meteorological Agency. December 26, 2016. Archived from the original on December 27, 2016. Retrieved December 27, 2016. ^ "Prognostic Reasoning for Tropical Storm 30W (Nock-ten) Warning Nr 24". December 27, 2016. Archived from the original on December 27, 2016. Retrieved December 27, 2016. ^ "RSMC Tropical Cyclone Advisory 271800". Japan Meteorological Agency. December 27, 2016. Archived from the original on December 27, 2016. Retrieved December 27, 2016. ^ "JMA RSMC Tropical Cyclone Advisory June 23, 2016 06z". Japan Meteorological Agency. June 23, 2016. Archived from the original on July 4, 2016. Retrieved December 4, 2016. ^ a b Significant Tropical Weather Advisory for the Western and South Pacific Oceans June 23, 2016 06z (Report). United States Joint Typhoon Warning Center. Archived from the original on March 10, 2015. ^ "THÔNG BÁO VÀ DỰ BÁO KHÍ HẬU THÁNG VIII, IX, X NĂM 2016" (PDF). imh.ac.vn (in Vietnamese). Vietnam Institute of Meteorology, Hydrology and Climate Change. July 11, 2016. Archived from the original (PDF) on September 3, 2016. Retrieved September 3, 2016. ^ "Marine Weather Warning for GMDSS Metarea XI 2016-08-06T12:00:00Z". WIS Portal – GISC Tokyo. Japan Meteorological Agency. August 6, 2016. Retrieved August 6, 2016. ^ "JMA WWJP25 Warning and Summary August 10, 2016 00z". Japan Meteorological Agency. August 10, 2016. Archived from the original on August 11, 2016. Retrieved August 12, 2016. ^ a b "Significant Tropical Weather Advisory for the Western and South Pacific Oceans August 10, 2016 06z". United States Joint Typhoon Warning Center. August 10, 2016. Archived from the original on August 11, 2016. ^ "JMA WWJP25 Warning and Summary August 11, 2016 00z". Japan Meteorological Agency. August 11, 2016. Archived from the original on August 12, 2016. Retrieved August 12, 2016. ^ "JMA WWJP25 Warning and Summary August 11, 2016 06z". Japan Meteorological Agency. August 11, 2016. Archived from the original on August 12, 2016. Retrieved August 12, 2016. ^ "JMA WWJP25 Warning and Summary August 12, 2016 18z". Japan Meteorological Agency. August 12, 2016. Archived from the original on August 13, 2016. Retrieved August 13, 2016. ^ "JMA WWJP25 Warning and Summary August 13, 2016 00z". Japan Meteorological Agency. August 13, 2016. Archived from the original on August 13, 2016. Retrieved August 13, 2016. ^ "Marine Weather Warning for GMDSS Metarea XI 2016-08-16T00:00:00Z". WIS Portal – GISC Tokyo. Japan Meteorological Agency. August 16, 2016. Retrieved August 16, 2016. ^ "Marine Weather Warning for GMDSS Metarea XI 2016-08-30T00:00:00Z". WIS Portal – GISC Tokyo. Japan Meteorological Agency. August 30, 2016. Retrieved August 30, 2016. ^ "Marine Weather Warning for GMDSS Metarea XI 2016-08-31T06:00:00Z". WIS Portal – GISC Tokyo. Japan Meteorological Agency. August 31, 2016. Retrieved August 31, 2016. ^ "JMA WWJP25 Warning and Summary December 10, 2016 12z". Japan Meteorological Agency. December 10, 2016. Archived from the original on December 10, 2016. Retrieved December 18, 2016. ^ "List of Retired Tropical Cyclone Names | Typhoon Committee". www.typhooncommittee.org. Retrieved 2018-03-04. ^ "Philippine Tropical Cyclone Names". PAGASA. January 2017. Archived from the original on 2016-12-28. Retrieved January 17, 2017. ^ a b "Report on TC's Key Activities and Main Events in the Region, 2016" (PDF). ESCAP/WMO Typhoon Committee. January 9, 2017. ^ a b "Global Catastrophe Recap August 2016" (PDF). thoughtleadership.aonbenfield.com. Aon Benfield. Retrieved September 8, 2017. ^ "Tình hình kinh tế — xã hội 8 tháng năm 2016" (in Vietnamese). General Statistics of Vietnam. Archived from the original on September 3, 2016. Retrieved September 3, 2016. ^ "Global Catastrophe Recap October 2016" (PDF). Aon Benfield. Aon Benfield. Retrieved 17 November 2016. ^ "Death toll rises to 15 after typhoon batters China, Taiwan". CTVNews. September 17, 2016. ^ "SitRep No. 9 re Preparedness Measures and Effects of Typhoon FERDIE (MERANTI)" (PDF). NDRRMC. September 21, 2016. ^ Kim, Bo-eun (6 October 2016). "Typhoon Chaba leaves hundreds of victims". Korea Times. Retrieved 7 October 2016. ^ "Global Catastrophe Recap October 2016" (PDF). thoughtleadership.aonbenfield.com. Aon Benfield. Retrieved November 9, 2017. ^ "SitRep_No_08_re_Preparedness_Measures_and_Effects_of_Typhoon_KAREN" (PDF). NDRRMC. Retrieved October 20, 2016. ^ "台风暴雨灾害致越南60人伤亡". 中国新闻网. China Press. Retrieved October 20, 2016. ^ ""莎莉嘉"袭击菲律宾 造成6人死亡26名渔民失踪". 中国天气网. China Meterelogical Agency. Retrieved October 20, 2016. ^ "SitRep No.9 re Preparedness Measures & Effects of Super TY LAWIN (I.N. HAIMA)" (PDF). NDRRMC. Retrieved October 25, 2016. ^ "Typhoon Haima leaves one dead in Hong Kong as city counts the cost". South China Morning Post. October 21, 2016. ^ "'Lawin': 18 dead, 40 thousand people still in shelters". Inquirer. October 22, 2016. ^ "Sitrep No. 04 re Preparedness Measures and Effects for TS MARCE (TOKAGE)" (PDF). NDRRMC. November 27, 2016. ^ "Sitrep_No_13_re_Preparedness_Measures_and_Effects_of_TY_NINA_NOCK-TEN" (PDF). January 9, 2017. Wikimedia Commons has media related to 2016 Pacific typhoon season.